One of the best things about hosting the Feminism Online Project events is listening to the diverse feminist voices engage in great conversation. Last night the Digital Sisterhood monthly Tweetchat discussed why women do or do not embrace the feminist identity. See the Twitter stream below. Do you have any thoughts on the topic? 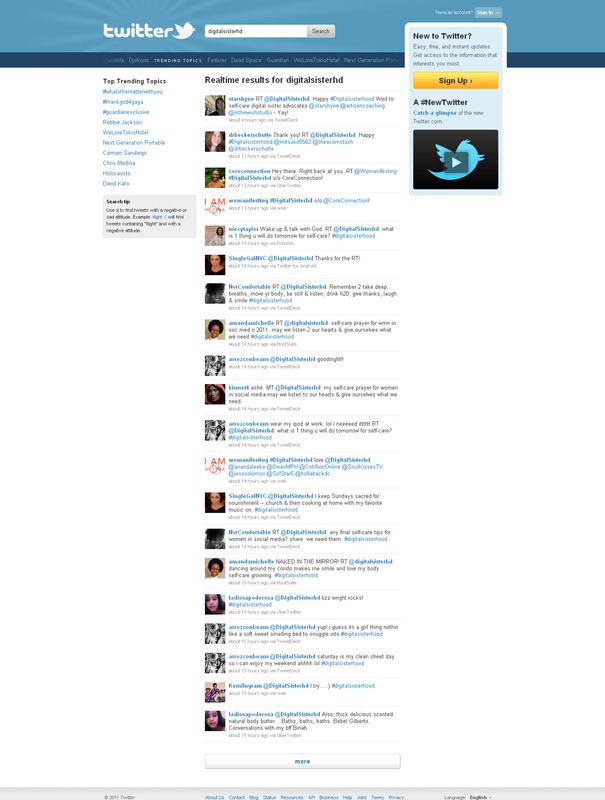 Yesterday, Digital Sisterhood Network hosted its first Tweetchat of 2011. The topic was how women in social media practice self-care. We had a lively discussion. Check out the Twitter highlights below. How do you practice self-care? Share your thoughts in the comment section. PR Professional Xina Eiland inspired Ananda to step her game in 2010. They met at Blogalicious 2009. Xina became Ananda's PR Coach. I moderated an amazing Tweetchat about inspiring and informative digital sisters on December 29. This Tweetchat gave women an opportunity to offer and receive praise for the many ways they inspired and informed each other in 2010. I shared how Xina Eiland inspired me to step up my online presence. We met during Blogalicious 2009 and became digital sisters during 2010. Xina currently serves as my PR coach. So she keeps me informed too! 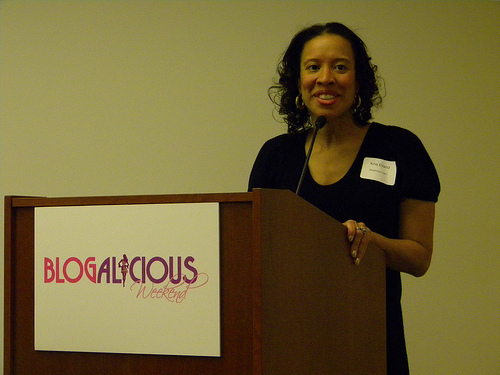 SavvyPreneur Deidre Mason, a digital sister lawyer, tweeted about inspiring lawyerpreneurs. What a great word – lawyerpreneurs! Soul Power Coach founder Adrienne Fikes saluted Core Connection Lifestyle founder Takeyah Young for her healthy cooking classes and rosemary infused cornbread. 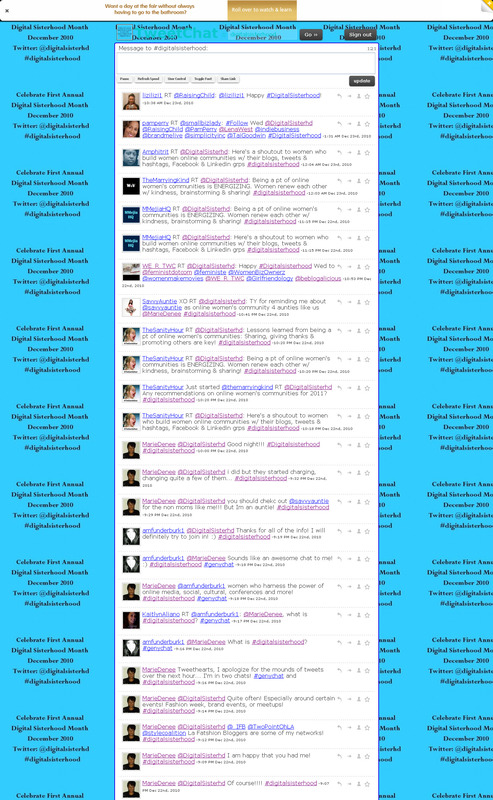 To learn more about the Tweetchat, see the Twitterstream below. Digital Sisterhood Month has sponsored four Tweetchats so far. Each weekly Tweetchat has given me an opportunity to witness the power of women sharing thoughts as they listen, learn, and laugh with each other online. No matter how many women participate, their conversations give birth to connection and community which lay the foundation for collaboration and commerce. And that’s the beauty of digital sisterhood! Check out the Twitterstream from the December 22nd Tweetchat on online women communities below. Feel free to share your own thoughts in the comment section of this post. Go ahead and start your own Tweetchat. Continue the conversation or start a new one. Always know you have the power to express yourself and own your space online and offline! Please join me for the final Digital Sisterhood Month Tweetchat on December 29 from 8:00 pm to 9:00 pm EST. The topic is the digital sisters who inspired and informed you in 2010.